All advertising depends upon the customer being ready, willing and able to respond to an ad. Trying to have your advertising reach your customer at the exact moment he is ready, willing and able, is close to impossible. Specialty advertising waits for the customer to get ready, be willing and be able to respond. All other advertising is lost if it does not hit at the perfect time. That’s why key chains, note pads, travel mugs, bags and other specialty items are perfect for keeping your business right in front of your customer! When they need your services – they think of you first! Properly designed specialty advertising is an investment in your business, not an expense. Unlike all other media that requires additional expense to repeat your message, specialty advertising will repeat your message for as long as the specialty item is in use – sometimes for years! Advertising using specialty items is economical! To be sure your return on that investment is a good one, it is not necessary to invest large amounts of money. Programs are developed that will fit your budget, and can be expanded as your business increases. 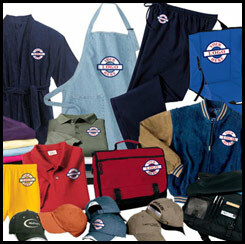 For over 20 years, Trophy Trolley has been setting the standard for trophies, embroidery, screen printing and etching. Our customers return to Trophy Trolley time and time again because the know the quality of our products an the attention to detail we put into each order. Whether your are shopping online, or in Traverse City we invite you to take a close look at The Trophy Trolley!